This name derives from the Ancient Greek “īáomai (ῑ̓άομαι) Iásōn (Ἰάσων)”, meaning “heal, cure, healer”. Jason was an ancient Greek mythological hero who was famous for his role as the leader of the Argonauts and their quest for the Golden Fleece. He was the son of Aeson, the rightful king of Iolcos. He was married to the sorceress Medea. 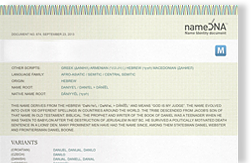 The name is also found in the New Testament, as the house of a man named Jason was used as a refuge by Paul and Silas.